I don't pay close attention to E3, but an announcement by From Software would interest me greatly. The timing seems right. I've seen various rumors but I won't give them space here. I would love to see something completely unrelated, thematically, to both Dark Souls and Bloodborne. I've said before that the Souls "formula" as it were lends itself better to unique stories than to sequels. What would all the Souls dorks like to see next from Miyazaki and Co? Yeah, what you said there. This is why I'm pretty excited to check out Nioh. A lot of people in the industry are expecting Bloodborne 2 but I'd like to see something different. Like Dark Souls 3, I wouldn't be disappointed; and of course I'm on board for absolutely anything From Software does from here. But I still think it's too soon for Souls anything. It's barely been over a year since the three-year onslaught and I think another year would probably do them good to give people more of a rest. And I figure why rush a sequel? People aren't going to lose interest at this point if you want another year. Dark Souls is now widely regarded as one of the best games ever made, so people will come no matter what. I tend to favour art that waits and watches what other artists are doing. I can only dream that they take inspiration from, say, Breath of the Wild. I would be perfectly OK with no release anytime soon as well, but I do look forward to hearing about what Miyazaki has been working on. I've got plenty to keep me busy with P5, and Nier Automata in the queue. I also just picked up Nioh on sale so there's that too. Needless to say my PS4 gets a lot of attention these days. Yeah, it's been a ridiculous year of releases for Sony so far. I'm with you guys. While I'd love to see Bloodborne 2 or Demon's Souls 2, I'd prefer Miyazaki to start something new. It's important to bear in mind that From Software is a big-ish company, so "From's next game" isn't necessarily "Miyazaki's next game," but with Ringed City out and the DkS3 patching at a point where it can readily be handed off to underlings, it's fair to assume that Miyazaki is working on something. Might be too early for them to announce anything about it, though, since games in high concept tend to stay that way for quite a while. Offhand I'd say the next announcement from From will be about Armored Core MMCCCXLVIII. As for Nioh, I'm curious about that too, but my dislike of Team Ninja is too great for me to be truly interested. If you try it out, xtal, report back! I will live vicariously through you. Oh, who am I kidding. I do that already. Pre-ordered. Comes with the bongo pack-in. First and most important, I have to make a note to get that font. I'm sure it'll come in handy somewhere. The internet sometimes gives us gifts, truly it does. Well by now the legions of Miyazaki fans on Tap have heard all about Sekiro: Shadows Die Twice. I'm just going to come right out and say it: I'm not super-enthusiastic about this one and I'm not sure why. I think it may just be the setting. Fantasy feudal Japan doesn't getting my juices flowing for some reason. And this is coming from someone who loves Onimusha. However, I am very happy that they ditched multiplayer. Dark Souls was quite a feat in terms of single-player vs multi-player balance. I know it wasn't perfect but it was really good. But I think they've struggled to keep that balance in subsequent titles. 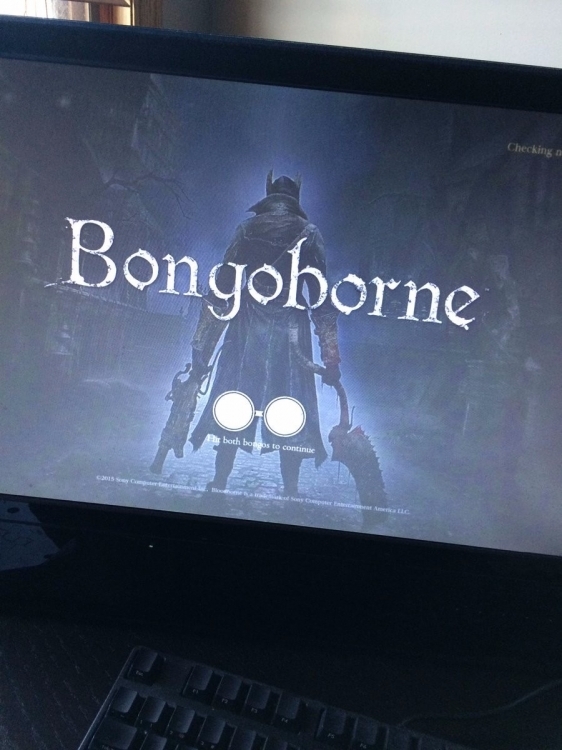 One reason I have such high regard for Bloodborne is that it has a tighter focus. I suppose I understand the complaints about lack of build variety and weapons choices, but for me it was a strength of the game. It didn't hurt that I really liked the gameplay style it chose to focus on. Also, I pretty much ignored the multi-player aspects (which had problems) with one exception: the Chalice Dungeons, although flawed, were great for coop. I spent hours down there having a great time. You could get really over-powered as a result. Anway, focus. That's what interests me the most about Sekiro. I've intentionally been avoiding watching people play the pre-release game. If I go in, I want to go in cold. I've spent some time with Nioh and I have to say it just doesn't do it for me. I can't really get my head around all the mechanics. Something about it, which I haven't been able to articulate, prevents me from getting hooked. I finished the tutorial area and am most likely close to the boss in the next area, the shipwreck coast. I honestly doubt that I'll come back to it though. I tend to agree, and setting is important. One of the strengths of Bloodborne and all the Souls games was the western setting, made by eastern designers. It resonated with me. And overall, like you Botch, I tend to be less intrigued by feudal Japan, maybe because I know very little about it overall. The risk Sekiro takes is that it might come off as a Souls-like, which would be weird coming from the director and team who explicitly created the Souls games. To really succeed, it needs to be its own game. Leaving out multiplayer is going to result in a different flavor. I loved the multi elements in Souls -- less so in Bloodborne because I never had much luck getting them to work -- but this type of game doesn't need it and I'm curious what design changes they'll make to accommodate the entirely-solo playstyle. Part of me thinks Miyazaki ought to do something significantly different, something more stridently outside the action-RPG style. Another part of me wonders why that first part of me feels that way; if action-RPGs are what Miyazaki likes to make, if they're what he's good at making, then that's what he should be doing. I read about Sekiro in Edge a while ago and it looks like they're working hard to make it something different than a Souls game, though they also understood how they're going to be shadowed (eh? eh?) by that comparison. We'll have to wait and see. Of course this is a day one purchase for me, but will it obsess me like Dark Souls did? I don't know!